Hibachi Pork Fried Rice is one of my favorite things about going out for hibachi! 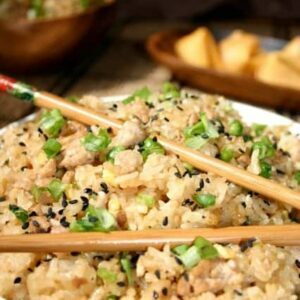 Now you can make this awesome pork fried rice right at home! Pork fried rice has many, many different interpretations. 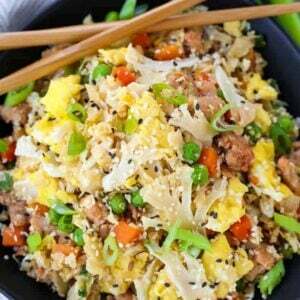 This fried rice recipe has a “hibachi” twist, so it’s a little sweeter than your average pork fried rice recipe. The key to making fried rice is that you have to cook the rice ahead of time and let it cool completely. That way the rice will separate into grains and won’t get mushy. No one wants mushy fried rice. 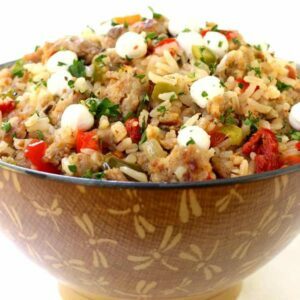 An awesome shortcut if you want a super quick meal, stop on your way home and grab a quart of rice at your favorite Chinese restaurant, dinner will be done in 15 minutes! How Do You Make Pork Fried Rice? You need to get a few things to make perfect fried rice. One is a hot wok or a large skillet if you don’t have a wok, and two you need to get all your ingredients ready. Ready and waiting for you and the hot wok. Start by cooking the beaten eggs in peanut oil. Yep, peanut oil. It makes such a big flavor difference, I might be using peanut oil in my scrambled eggs from now on. IF you don’t have peanut oil you can use canola or vegetable oil, just not olive oil for this fried rice recipe because the cooking temperature is too hot. Remove the eggs from the wok and add the pork, breaking up in pieces to brown. Then you add in the vegetables, rice, and the eggs. Season it up with soy sauce and sesame oil and you’re good to go. What Can You Substitute In This Fried Rice Recipe? I like to add some hot sauce, or crushed red pepper flakes to mine but you can customize it however you’d like. Sesame seeds and sliced scallions on top are a nice garnish to add some flavor and some crunch. You can also swap in ground chicken, turkey or beef instead of pork! Pork is just the traditional ingredient but most other proteins will work, even tofu will work if that’s your thing! Any other vegetables you have in your fridge will work in this fried rice recipe too. Chopped broccoli, shredded carrots, cabbage, asparagus tips or cauliflower are all good choices. Even cauliflower rice instead of the real rice in this recipe to make it a low carb meal! 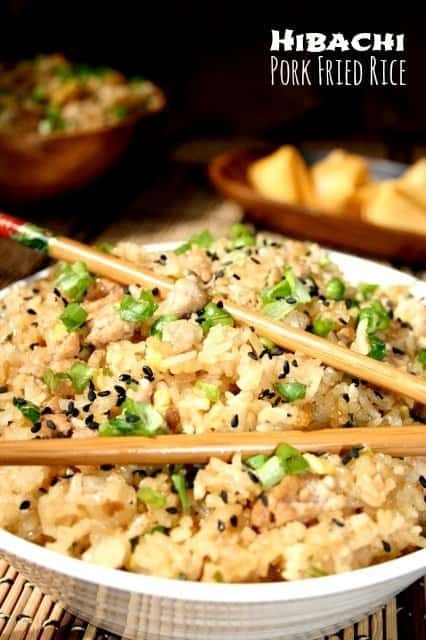 This better than take out pork fried rice is going to be your new favorite rice recipe! Swap out the pork for chicken, turkey or beef if you like! Cook the rice according to the package directions and cool in the refrigerator for at least 2 hours. Heat up a wok or a large non-stick pan on high heat. Add 1 T. peanut oil and cook the beaten eggs until just set, about 2 minutes. Remove the eggs from the pan and add in another tablespoon of peanut oil. Add in the ground pork breaking up into small pieces until browned. Add 1/2 t. of salt and 1/2 t. of pepper to the pork and stir. 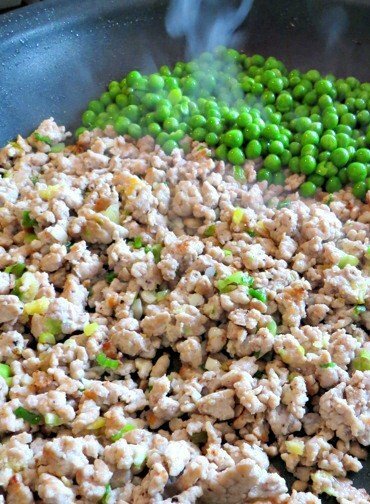 Put the peas, scallions, ginger, soy sauce, sesame oil, scrambled eggs and rice into the pan with the pork and cook for 3-4 minutes on high heat until all the ingredients are combined. Add in the pineapple juice and teriyaki sauce, stir a few times, then season with the additional 1/2 t. of salt and pepper to taste. 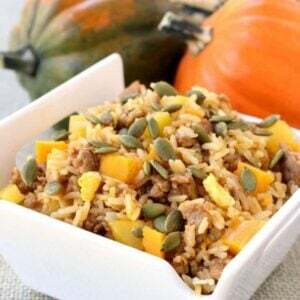 You can use ground beef, ground chicken, shredded chicken or any protein you like in this rice dish. You could also leave it out to make it a vegetarian meal. For a short cut, use a quart of rice from your favorite chinese take-out restaurant! WOW! This looks soooo good. I have to share it. Thank you Maggie- I hope you try it!